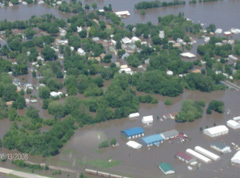 Last June’s floods devastated a number of eastern Iowa cities and towns. In Palo, city leaders say up to 400 of the town’s roughly 1,200 people moved away. They’re now talking about offering incentives for people to move back to the Linn County town. But, people like Mary Shakespeare feel like they should get something for staying put. She and her husband, George, have lived in Palo for 36 years and just recently finished cleaning up their flooded home. “I realize we need more people,” Mary said, “but we can’t forget about the people that did stay.” The Shakespeare’s say it’s not right to offer new homeowners incentives when flood victims are still hurting. Mayor Pro-Tem Paula Gunter says the city has to do something to get people to move back. “We’re losing some of our tax base with the flood and the number of houses being demolished, so we just want to grow Palo,” Gunter said. Three million dollars of assessed property value will vanish after all the flood damaged homes in Palo are demolished. That’s why the city is talking about offering six months of free sewer service and the Rebuild Palo group wants to offer a $3,000 grant to people who build new homes in town. Palo’s city council will vote on the free sewer service proposal at its next meeting. Council members said they’ve already done a lot to help their current residents including lowering property taxes, offering free flood debris dumpsters and providing a free month of sewer service.